This full day tour encompasses a little bit of everything from award-winning wine, hand-crafted beer, flavorful spirits and liqueurs as well as delicious cider. You'll visit a charming winery, a small micro-brewery, a distillery and a cider house - all while being surrounded by the natural beauty of the Annapolis Valley. Tour includes lunch either at a winery or at a micro-brewery. Your 6.5-hour tour begins at charming Gaspereau Vineyards located in the heart of the Gaspereau Valley. This winery enjoys one of the warmest micro-climates in the area and has an outstanding variety of wines from whites, reds, roses and dessert wines! Enjoy a guided private vineyard tour and a wine tasting on the sunny patio overlooking the vines! Next, you'll visit Wayfarers' Ales on the Wharf - the newest micro-brewery in the area started by a co-operative of local craft brewers. Sip on a variety of samples as you learn about the brewing process on a tour of the facility. Take in the expansive views of the Acadian dykelands and watch the tides rise and fall in the Cornwallis River. that the micro-brewery overlooks. Lunch is also included either at Gaspereau Vineyards or at Wayfarers' Ales (alternates weeks). Lunch is a personal-size pizza of your choice with a glass of wine or a pint of craft beer. Afterwards, visit newly opened Barreling Tide Distillery for a tour of the facility to discuss how they make their small-batch spirits followed by a tasting of vodka, gin and fruit liqueurs! Find out how to pair these products with food and get great recipes for a tasty cocktail! 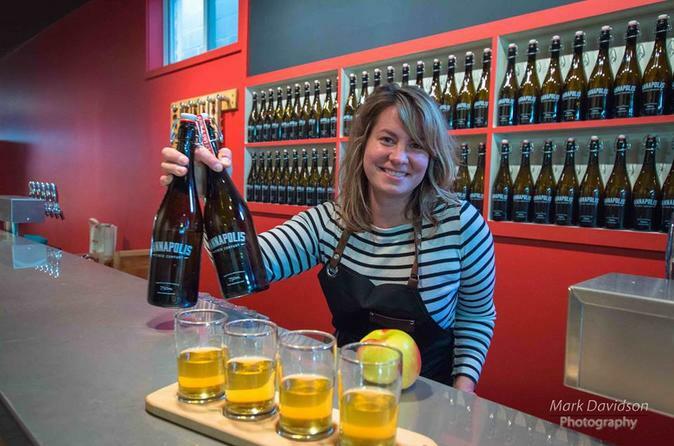 Finally, you'll stop in at Annapolis Cider Company located in the heart of Wolfville for a guided tour and tasting of 3 different ciders made from local apples. Try their Sweet and Juicy and Crisp and Dry ciders as well as the ever changing “Something Different” that is sure to tempt your taste buds! Pack your purchases in your complimentary tote bag!